Windows 7 Is Available With Full Of Ideas For You ! 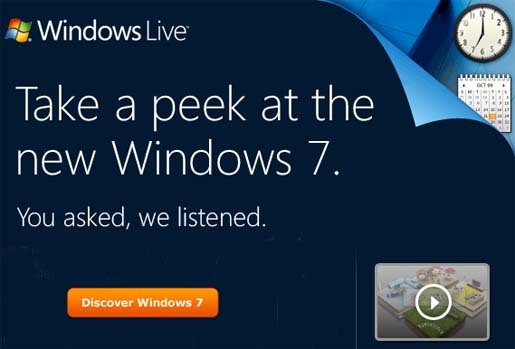 Windows® 7 is full of ideas from Windows Live users like you—ideas that help make everyday tasks a little bit easier. Like simplifying the way you use your PC and making it easier to connect to the people, places, and things in your life. Find out more about all the ways Windows 7 helps simplify your PC. • Use snap to compare two files side by side with a quick drag to the edge of the screen. Size and arrange windows by simply dragging their borders to the edges of your screen. Instantly expand to full screen and back, or arrange two windows side by side. • Cruise through all your open windows with Live Taskbar Previews. Manage lots of open programs, documents, and browser windows easily with thumbnail and full-screen previews of open windows. • Using HomeGroup Easily share the photos, music, and files on each of the PCs running Windows 7 on your home network. It's especially handy when you want to share a printer. • Windows Search lets instantly locate and open virtually any file on your PC, from documents to emails to songs, right from the Start menu just by typing a word or two.